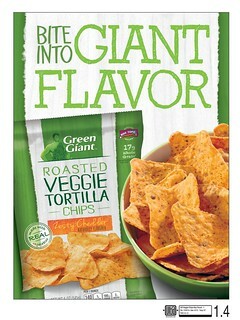 Did you know Green Giant has a line of veggie chips? I didn't. But I love chips, so this campaign called out to me. I received two flavors to review, and evident by the crinkly, opened bags that are obviously not full, I did just that. I should be ashamed that I ate the equivalent of a bag's worth of chips over the course of 3 days, yet I don't because they were tasty. As always, I have my thoughts about them, since this is a review and my objective wasn't just to satisfy my penchant for savory snacks. Let's start with my favorite. I wasn't expecting to enjoy the barbecue flavored sweet potato chips as much as I did. At first, the barbecue flavor was stronger in scent than taste, but I eventually noticed a spicy after note after munching on 2-3 servings of chips. The spicy, savory flavoring contrasted against the sweetness of sweet potato, though honestly I'm not sure if that sweetness came from the flavoring or from the sweet potato powder. Texture-wise, I was reminded of a certain potato chip that begins with a 'P' and ends with an 'gles'. I liked them the most because they were more what I expected these chips to be. Ranch. No, Garden Ranch. I fully expected these to be my favorite, as I love ranch dressing (did you know there are people who hate it? Yeah, weirdos. 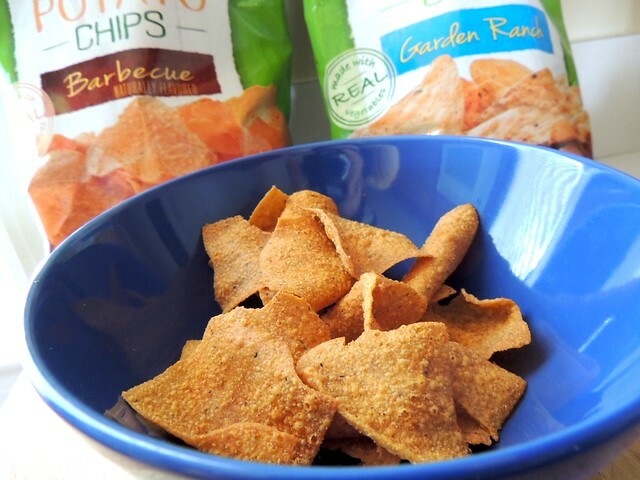 ), though the chip is more of a corn chip with additional vegetable powders than a veggie chip, if you know what I mean. Yes, they are called "tortilla chips". Clearly I didn't realize that - oversight on my part. Anyway, the ranchy flavor was still good, despite not detecting any hints of "garden", and enjoyable, just not outstanding when compared to the sweet potato barbecue chips. 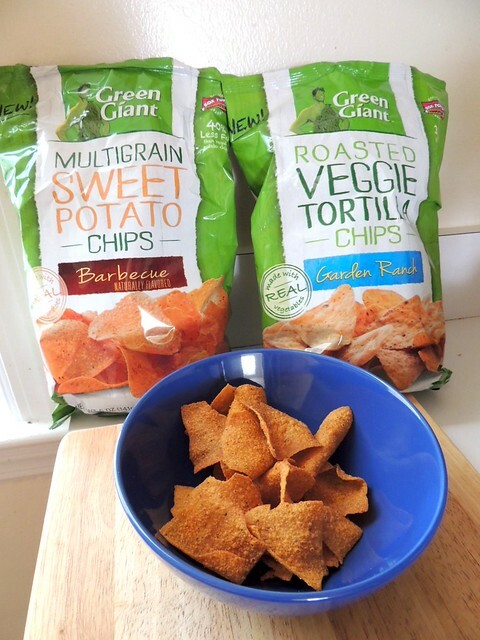 The difference between these chips, besides the obvious, is that the Garden Ranch is a roasted veggie tortilla chip while Barbecue is a multigrain sweet potato chip. 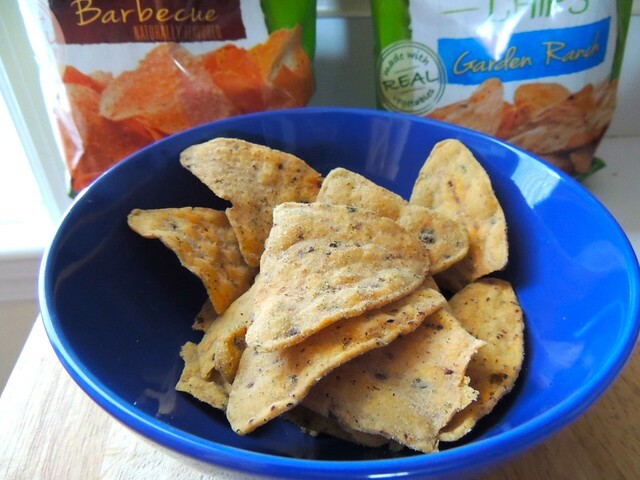 Whole grain corn/corn flour is the first ingredient in both, with the tortilla chips containing red and green bell peppers, buckwheat, sorghum flour, millet, quinoa, and various dried vegetable powders, and the sweet potato chips containing sweet potato powder, brown and white flours, and buckwheat flours. Also, various barbecue flavorings and seasonings. What these aren't, are "natural"; there are a few ingredients that push it away from that category. Nonetheless, they are tasty and if I found them on sale, I'd pick up another bag. Additional pros are that a serving contains between 14-18 grams of whole grains per serving and are both relatively lower in fat than other chips. Alongside a burger, dipped in hummus, or straight from the bag, they make for a delicious snack. If you'd like to try them, you can find them at various grocery stores, retailing at $3 a bag. You can get a coupon by clicking at the link at the very top of the page. You have published article with perfectly! I truly think this website needs much more consideration. I’ll probably be again to read much more, thanks for share that info. I am happy to join your community, found a lot of useful and helpful information! By the way, here you can find my blog at Custom essay writing service feel free to check it and find a lot of interesting content.